There are approximately 1,500 fatalities on Georgia roadways every year. Approximately 300 of those involve alcohol. Alcohol-related fatalities should never happen, but if you or a family member is a victim of drunk driving, we are here to help. Drunk driving is one of the most preventable and tragic events for any person or loved one to endure. Georgia laws prohibiting driving under the influence of alcohol or drugs are among the most stringent in the country. Despite the strength of the law, many people still decide to risk their lives and others while on the road. Slappey & Sadd, LLC has handled many driving under the influence cases for the purpose of deterring future drunk driving, while compensating our clients to the fullest extent the law allows. Compensation any victim of a drunk driver receives is often elevated by the fact that the negligent driver was driving under the influence. These factors should be taken into consideration by the attorney handling your case, along with the injuries, lost wages, and pain and suffering the victim endures as a result of the alcohol-related accident. It is not unusual for punitive damages to be awarded to punish and deter the drunk driver, in the hope that the dangerous behavior will not be repeated in the future. Slappey & Sadd, LLC if you have been injured or have lost a loved one because someone else was driving under the influence, we will advise you as to all of your rights, and make sure those legal rights to compensation for your losses are aggressively pursued. Alcohol-related accidents cause the most preventable and tragic injuries and deaths in society today. Drinking alcohol and driving simply do not mix. The law prohibits both drunk driving and the furnishing of alcohol to a minor or other person who they know is about to operate a motor vehicle. In other words, a drunk driver is always liable for harm caused by his negligence, but often there is additional liability for injuries caused by the bar or restaurant that provided the alcohol to the driver. Our lawyers have experience in all these areas of the law. Individuals under the age of 18 do not have the physical or emotional maturity to handle the consequences of alcohol consumption, therefore, anyone who supplies alcohol to young drivers can be held legally responsible for the harm caused by that young driver. Anyone, be it a business or an individual, who provides alcohol to minors can be held responsible for damage caused by those minors. 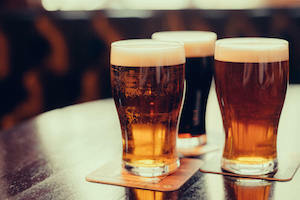 Businesses can also be held responsible under the law for continuing to furnish alcohol to persons who are already intoxicated who then cause damage to others. We recognize how devastating these alcohol-related accidents can be to innocent victims. In addition to being compensated for medical expenses, lost wages and loss of quality of life, punitive damages are often awarded to punish and deter the drunk driver from harming others in the future. Atlanta, Georgia Personal Injury Attorneys Slappey and Sadd represent alcohol-related victims of drunk driving, personal injury and automobile wrongful death cases as a result of drinking and driving accidents. These actions can cause serious damage to vehicles and inflict life threatening injuries to passengers and drivers of other vehicles as well as pedestrians. When a driver becomes impaired by alcohol and falls asleep behind the wheel, he or she could be driving at any speed. The higher the speed, the more likely serious injuries will take place to anyone who is driving or is a passenger in another vehicle person that collides with the vehicle in the alcohol related accident. Serious injuries could include traumatic brain injuries, spinal injuries, amputations and severe breaks to bones. If the vehicle’s fuel tank explodes, serious burning could occur too. Many injuries that take place in an alcohol related accident, if loss of life has not taken place, can be life changing and involve long recovery periods. Often the victim fails to fully recover and may die early as a result of the trauma. When injuries result from an accident that has been proven to have been caused by a DUI driver, you may be entitled to file a personal injury claim from the person who caused the accident. In most states in the U.S., a victim who has been injured in a crash that was not his or her fault may have the legal right to file a personal injury claim to recover the financial loss as a result of the injury. It is not always a simple matter and if the injury has cost you or is likely to cost you more than 2,000 dollars you should seriously consider hiring a personal injury attorney to pursue your claim. During what is commonly a free consultation, the personal injury attorney will assess your likelihood of winning a successful claim. Most attorneys pursue personal injury claims for clients on a contingency fee basis, and will not normally advise filing a claim unless the chance of success is sufficiently high. If the claim is not successful, you as the victim will not normally be required to pay any legal fees, as the attorney will cover his or her losses. When you have hired an attorney a calculation of your financial losses will be made. This will include the full value of your medical treatment, loss of earnings from the time of the injury to the day you return tom work and, in most states, an amount for pain and suffering. If the driver or any other person who caused the alcohol related accident is found to have behaved in a reckless manner, punitive damages may be pursued as well.